CMC deliver the full range of Prosci® role based change management workshops – and in addition can provide advisory support for your specific change initiative. Information on each of the additional CMC services is provided below. or call the CMC Capability Building team + 44 (0) 1600 740 023. Public, open enrolment training is available for individuals and small organisational groups - provided at selected Regus venues in Singapore. Prosci® Delivering Project Results is a one day workshop designed for Project Managers and Project Teams to help address one of the most pressing issues facing practitioners today - the integration of change management and project management. Designed to help bring the two disciplines together this results orientated workshop provides participants with awareness of how change management can help meet a project’s intended outcomes. Next date for public open enrolment training is 3rd July. Prosci® Sponsor Briefing is a half - one day workshop that equips Executives and Senior Leaders with the skills and techniques to lead and sponsor successful organisational change. Executives and Senior Leaders are shown how to assess the status of their organisation’s change portfolio, and how to use Prosci’s research-based methodology to maximise the return-on-investment of the changes they are leading. Prosci® Managers Workshop is a one day workshop designed to equip participants with the skills and techniques to manage the impact of change on themselves and coach employees through change to deliver successful transformation. Participants are taught how to apply the Prosci® ADKAR® Model. The workshop focuses on the key role played by managers and supervisors to ensure the success of change initiatives. Prosci® Orientation for Employees is a one day workshop based on the Employee's Survival Guide to Change and the Prosci® ADKAR® Model empowers frontline employees with the competencies required to embrace and adapt to organisational change. Prosci® How to Write the Business Case for Change Management is a one day workshop designed to equip individuals with a tool and method for making a business case for change management. This includes access to Prosci Return on Investment Calculator, a cloud tool used to quantify the degree of project benefits attributable to people successfully adopting the change. Also delivered as group training on client site, pricing available on request. Prosci® Enterprise Change Management Boot Camp (ECM) is a one day interactive, fast paced program designed to help make change management a core competency for your organisation. The workshop is ideal for those charged with developing organisational change management capability. The workshop guides delegates through the steps required to build a compelling case for Enterprise Change Management in their organisations, and shows them how to use Prosci’s Change Management Maturity Model™ to assess and improve organisational change management capability. Next date for public open enrolment training is 25th August. 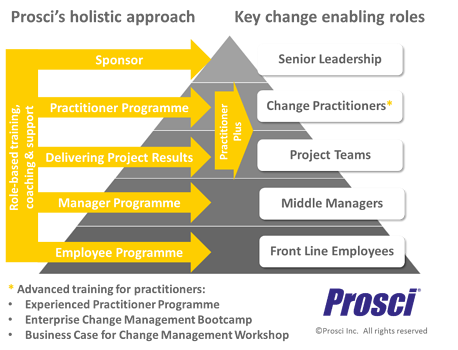 Prosci® Experienced Practitioner Programme is a three day workshop designed to enable experienced change management practitioners to develop an enhanced perspective of how to drive best practise change management within their organisation. The workshop provides an opportunity to collaborate with and learn from other seasoned change practitioners as you analyse case studies, assess complex change scenarios, and explore the seminal change management literature. Dates and pricing for public open enrolment training available on request. Prosci® Train-the-Trainer is a three and a half day workshop designed for experienced Prosci Certified Practitioners who need to cascade Prosci change management training within their own organisation. 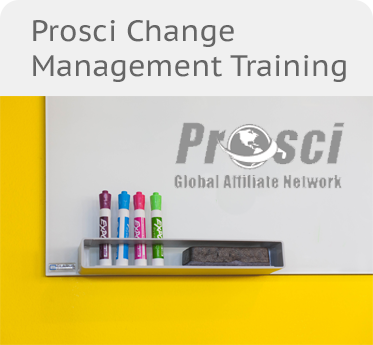 The training provides experienced change management practitioners with the knowledge, tools and confidence to deliver Prosci® Change Management training to other employees. Please note: participants will only be licensed to deliver training within their own organisation, and for any training course which they deliver are required to purchase additional materials sets /licenses from Prosci. Full details provided on request. CMC Practitioner Plus© CMC’s focused advice + support for certified Prosci Practitioners. Delivered by CMC’s Prosci Experienced Practitioners, Practitioner Plus provides confidential, structured support and guidance for your change management challenges, one-to-one or for small groups. One-off sessions are available to support those with immediate challenges or multiple sessions as a package taken over a longer period. CMC Change Management Support Workshops and Advisory services can be tailored to the specific requirements of your organisation. Our change management experts will work with you to define the exact support requirement and help determine the most beneficial/appropriate options for your organisation. Pricing for Advisory services available on request following a scoping discussion. *Please note: Guide pricing ONLY provided on this site. The final cost of each customer workshop / support service will be confirmed following discussion of customer requirements, including degree of workshop preparation and final numbers of confirmed participants attending each workshop. -Local tax will be charged, if applicable. -CMC staff expenses for training delivered outside of City of Singapore. *Prosci®’s 2016 edition Best Practices in Change Management benchmarking report shows that effective change management plays a crucial role in projects meeting objectives, finishing on time and on budget, and realising their expected return on investment. All Rights Reserved. Used with permission. ADKAR® and ADKAR® terms (Awareness, Desire, Knowledge, Ability, and Reinforcement®) are registered trademarks of Prosci® Inc. Used with permission.